Jade Stewart has been named the Holland College Hurricanes Athlete of the Week for the week ending September 16th. Stewart, a first year left wing, scored the Hurricanes only goal in their 4-1 loss to the MSVU Mystics, while also scoring in the team’s 4-3 win over the UKC Blue Devils. 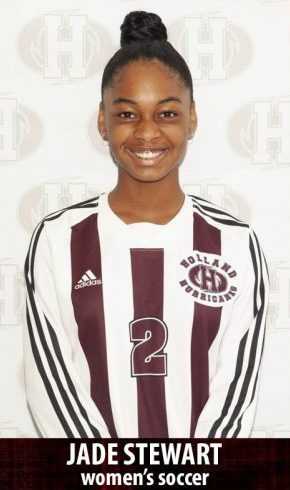 Stewart has four goals through four games to start her collegiate soccer career with Holland College. The Women’s Hurricanes are 3-1-0 this season and in second place in the ACAA standings. The Warwick, Bermuda student-athlete is studying in the Sport & Leisure Management program at Holland College.